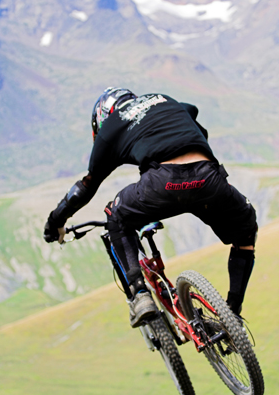 Learn to pilote a downhill MTB in the 2 Alpes Bikepark or furrow wild trails of Oisans with Enduro. Absolute pleasure! 4 instructors, wil be happy to share with you joys of MTB steering for every levels. • Discovery: Test and fun down the tracks before make a downhill on the 2 Alpes BikePark. • Introduction: Getting started and progression of downhill bikes of the year. • Progress: Technical Progress and get on the 2 Alpes Bikepark. To Those it's necessary to Already have experience in DH. • Private lessons: personalized technical back up andan adapted ride which mix pure pleasure / Security. Equiped of all New MTB Scott electrical suspended, we offer a wide range of outputs. From the family outputs to the sporting and technical getaway, we'll leave to discover the surrounding mountains off the beaten track. A trail network unlimited, Oisans is a temple of Alpine mountain biking. Tanks to our logistics (minibus driver + minbus + trailer) we will go on the singles until we wiil be blue in the face.